[PDF] The Texture of Contact: European and Indian Settler Communities on the Frontiers of Iroquoia, 1667-1783 (The Iroquoians and Their World) | Free eBooks Download - EBOOKEE! Posted on 2017-12-23, by luongquocchinh. 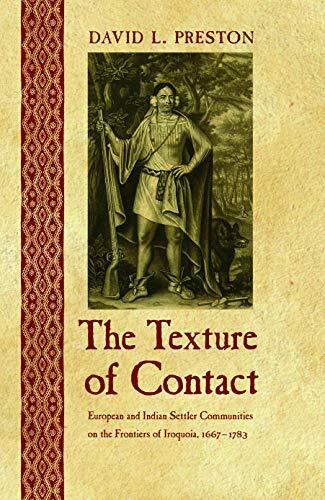 Description: Winner of the 2010 American Historical Association and Canadian Historical Association's Albert B. Corey Prize Winner of the 2010 Annual Archives Award for Excellence in Research Using the Holdings of the New York State Archives The Texture of Contact is a landmark study of Iroquois and European communities and coexistence in eastern North America before the American Revolution. David L. Preston details the ways in which European and Iroquois settlers on the frontiers creatively adapted to each other s presence, weaving webs of mutually beneficial social, economic, and religious relationships that sustained the peace for most of the eighteenth century. Drawing on a wealth of previously unexamined archival research, Preston describes everyday encounters between Europeans and Indians along the frontiers of the Iroquois Confederacy in the St. Lawrence, Mohawk, Susquehanna, and Ohio valleys. Homesteads, taverns, gristmills, churches, and markets were frequent sites of intercultural exchange and negotiation. Complex diplomatic and trading relationships developed as a result of European and Iroquois settlers bartering material goods. Innovative land-sharing arrangements included the common practice of Euroamerican farmers living as tenants of the Mohawks, sometimes for decades. This study reveals that the everyday lives of Indians and Europeans were far more complex and harmonious than past histories have suggested. Preston s nuanced comparisons between various settlements also reveal the reasons why peace endured in the Mohawk and St. Lawrence valleys while warfare erupted in the Susquehanna and Ohio valleys. One of the most comprehensive studies of eighteenth-century Iroquois history, The Texture of Contact broadens our understanding of eastern North America s frontiers and the key role that the Iroquois played in shaping that world. No comments for "[PDF] The Texture of Contact: European and Indian Settler Communities on the Frontiers of Iroquoia, 1667-1783 (The Iroquoians and Their World)".